My FQS Blogger's Bundle + a Giveaway! Hey y'all! So I've been keeping this little secret under warps (although you may have heard about it if you follow me on Instagram) but it's finally time for the reveal. 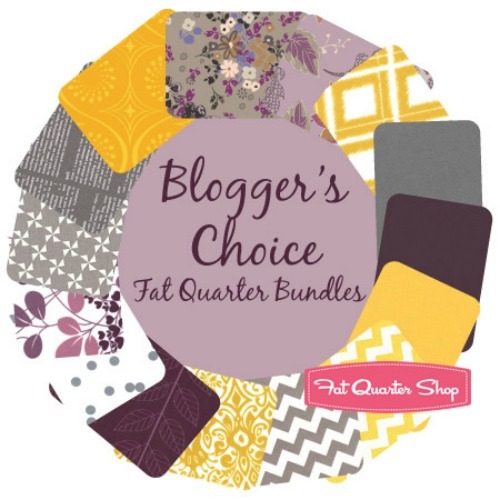 A couple of months ago I was asked by Fat Quarter Shop to make up one of their super-awesome Blogger's Bundles. What, who me?! Well, of course, I'd love to! This is my bundle - what do you think?! I must say... I'm loving it! Picking a Blogger's Bundle is not the easiest thing in the world; first of all, there are so many new amazing fabrics out there. When I first started picking my fabrics, I was overwhelmed by the selections and picked a whole bunch that were in no way cohesive, so then I ended up picking out my solids and going from there. Oh ya, that's the stuff! Yep, I'm pretty much in love with the eggplant, saffron, and slate colours I built off of. So, I bet you want to know about the giveaway, right?! You have two chances but please be sure to leave separate comments for each entry. 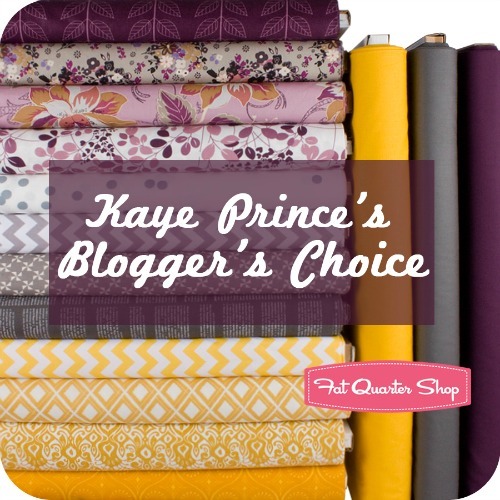 you would base a Blogger's Choice bundle off of! That's it! Two easy-peasy ways to enter! I will choose the winner one week from now (on December 20th) and announce it here on the blog. International entries are, as always, welcome! Also, please remember that I have comment moderation enabled so if you don't see your comment right away it just means that I haven't had the chance to approve it yet (duplicate comments will be deleted). 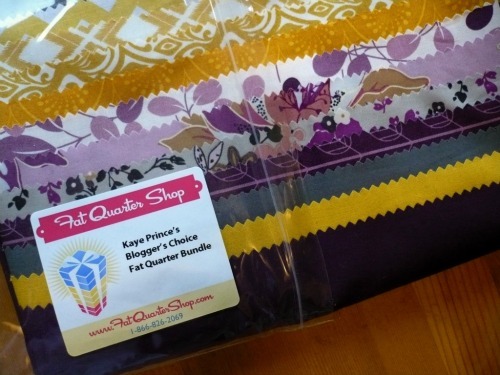 Fat Quarter Shop is also doing a giveaway on their blog for my bundle right now, so if you want the chance to win a second bundle, I'd hop on over there! Well, phew, it's been quite the busy week! Not only did I have to surreptitiously finish Alex's Hanukkah present while he wasn't home (happy first night everyone!!) 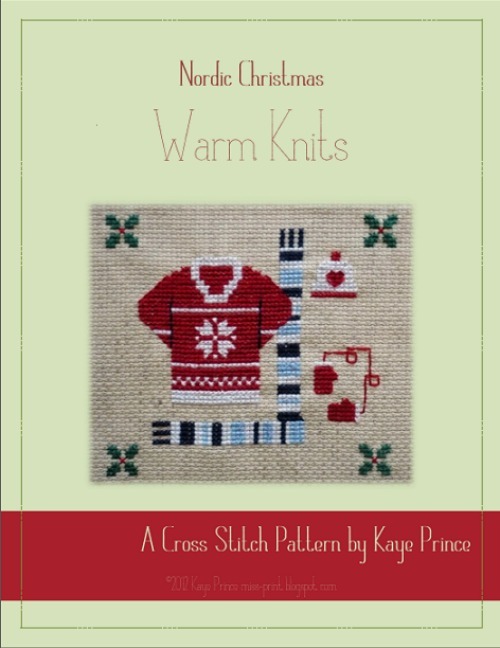 and work on some Christmas presents for my mum, but I also completed the sample for the third and final pattern in the Nordic Christmas series - hurray! Warm Knits features a Scandinavian inspired sweater along with a scarf, mittens, a hat, and a little holly - I think it might actually be my favourite of the three! 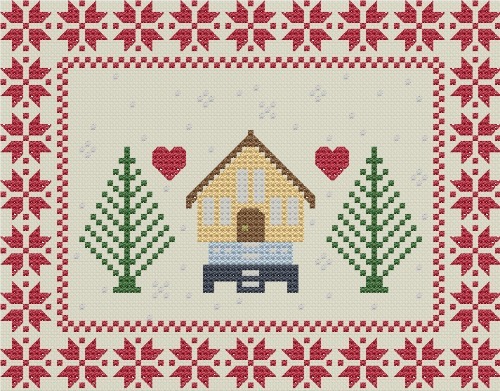 I must say that this pattern actually gave me the most problems when trying to decide what would be what colours - I wanted to use the same colours that are found in Winter Chalet to give it a cohesive feel but couldn't decide what item should be which colours. In the end though, I'm happy with the result! 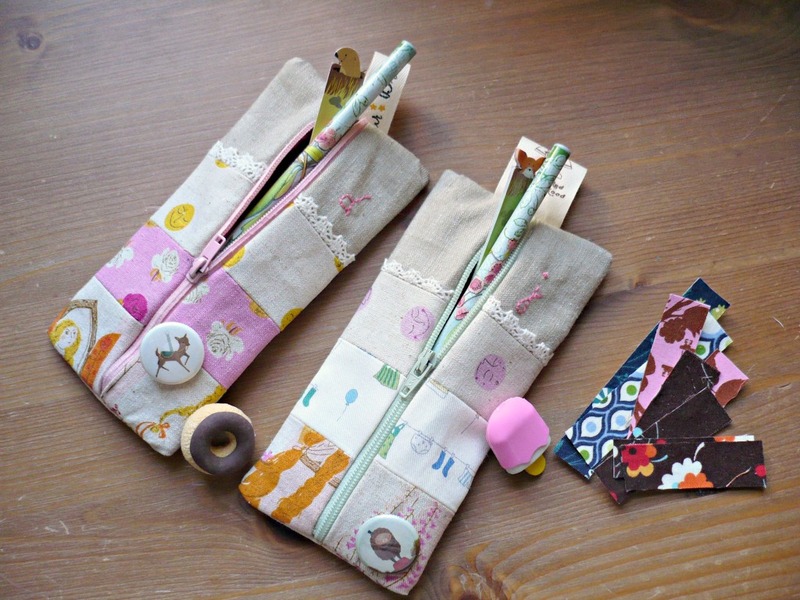 Just as a little special something, I've decided that if you want all three patterns that you should get a wee discount! There is a special listing in both the Etsy and Craftsy shops! I have really enjoyed designing this series and getting it out there to everyone! It has been a labour of love and I'm super-excited to see your creations. 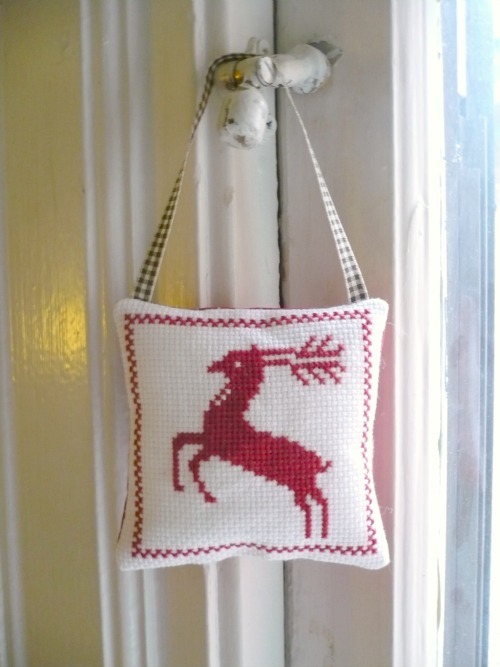 I've already started working on my ideas for next year and I think I know what the theme will be (Scandinavian-inspired Twelve Days of Christmas, anyone?) but that sure is a long way off, ho hum. I guess I'll just have to come up with some other ideas in between! Sounds good to me. 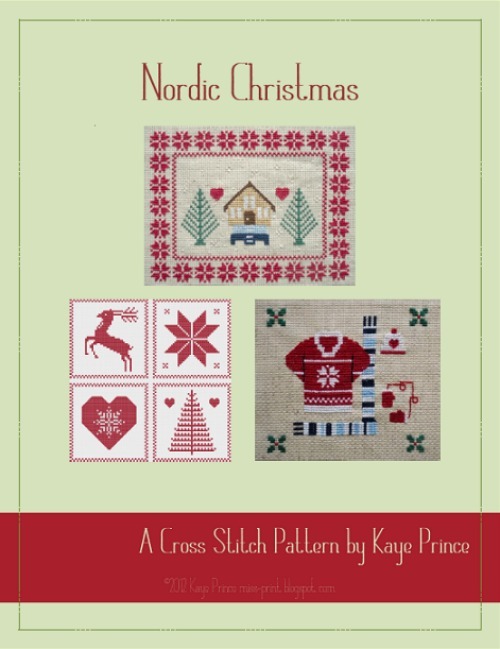 I'm super-excited to announce that the second pattern in the Nordic Christmas series is now available - yay! 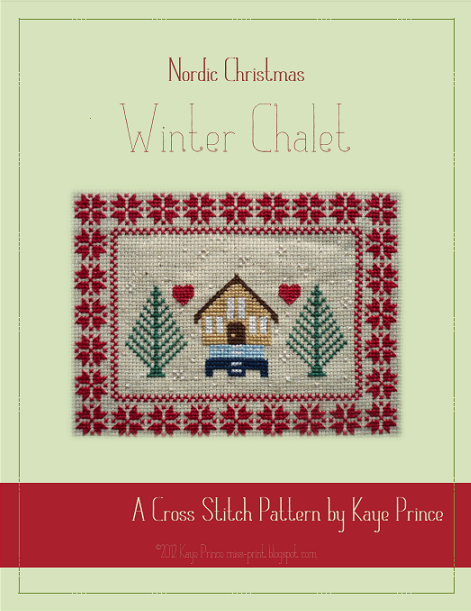 Ornament Sampler is again, like Winter Chalet, inspired by all things Nordic and Scandinavian. I took many common motifs, revamped them a little, and turned into something fun that can be stitched up two ways. 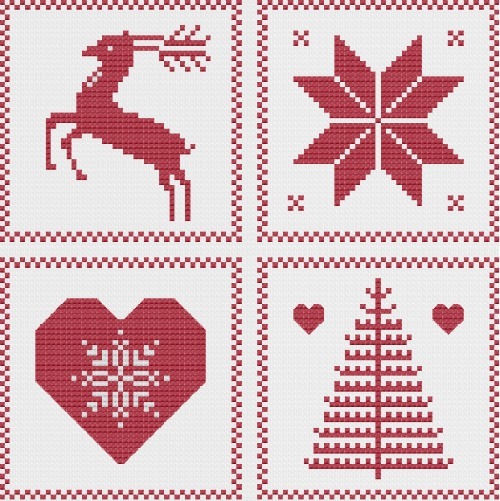 Ornament Sampler can be purchased from either my Craftsy or Etsy shops. 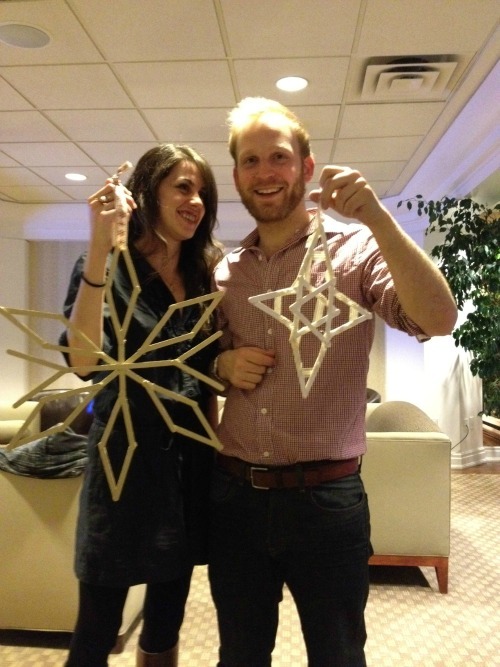 Turn it into an ornament - and that's where the tutorial comes in! 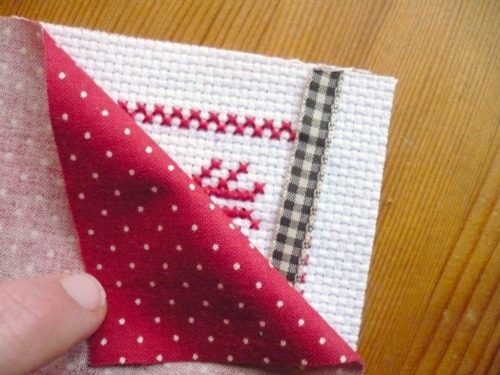 Trim your cross stitch down to a 4.25" square leaving about 1/2" on every side of the stitched border. Cut your piece of grosgrain ribbon to 8" in length. 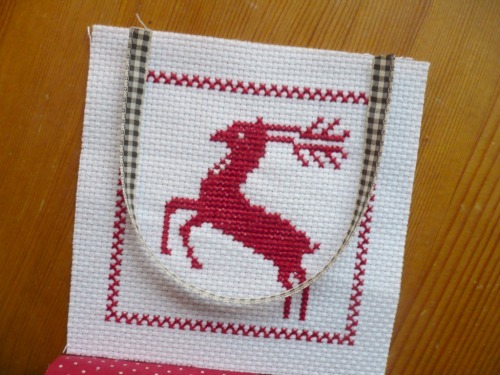 Lay out the cross stitch face up and loop you ribbon being careful not to twist. 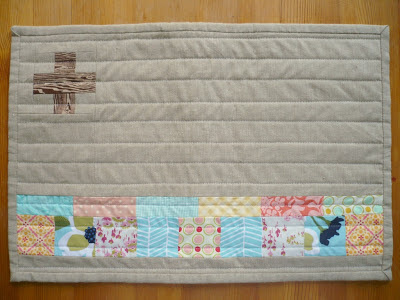 Line the sides of the ribbon up with the edges of the border so that the ribbon is about 1/2" from the sides of the cross stitch; line the cut edges of the ribbon up to the top edge of the cross stitch as shown in the photo above. 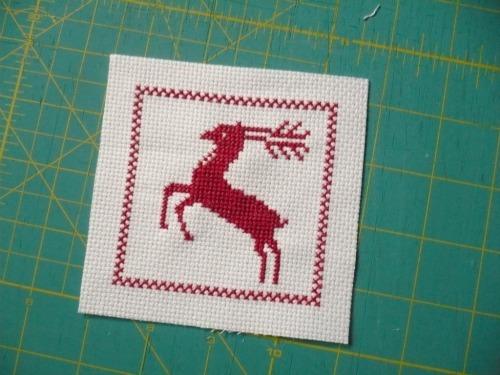 Lay the 4.25" square of scrap fabric face down on to the cross stitch, sandwiching the ribbon in between. Pin all of the way around the sandwich being extra careful to catch each edge of the ribbon in a pin so that it doesn't shift while sewing. 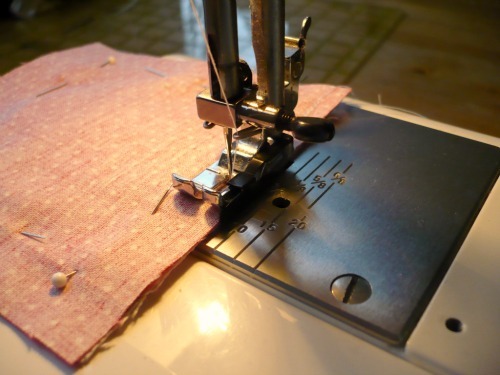 Using a 1/4" seam sew around all four sides leaving a 1.5-2" opening along the bottom edge. 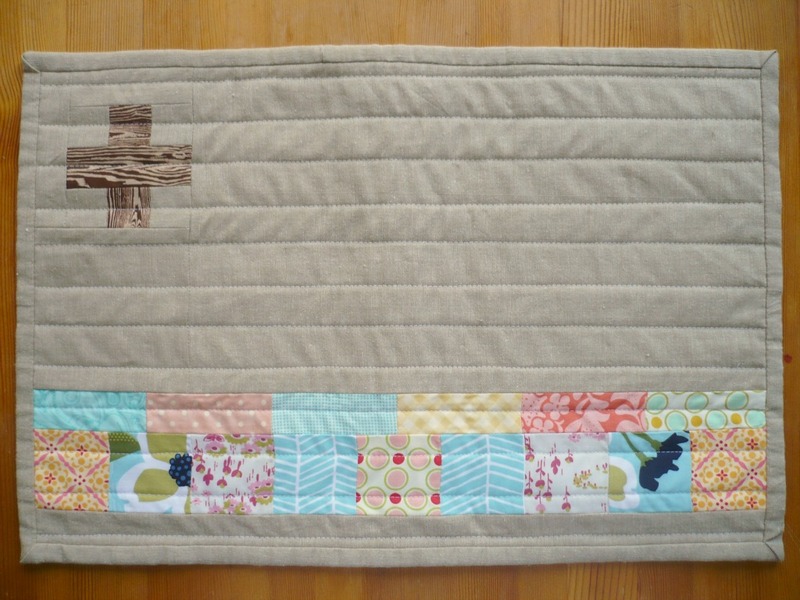 To make sure that the ribbon is secure, back-stitch over each piece a couple of times when you reach it. When you're finished, clip your corners and turn the square right side out. Poke the corners out and press flat, being sure to turn the edges in at the opening. Using the opening at the bottom, stuff the ornament full of poly stuffing. Don't over-stuff or else little fibres might starting popping through the aida. 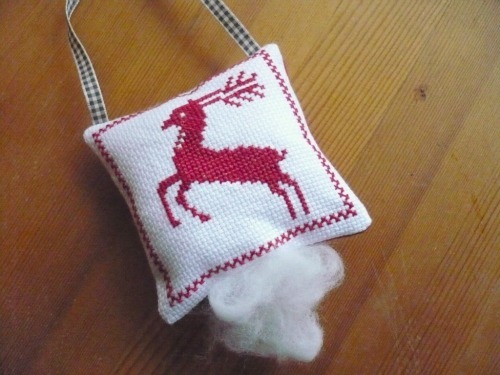 When you're finished stuffing, whip stitch the opening closed using a neutral coloured thread. And you're done! 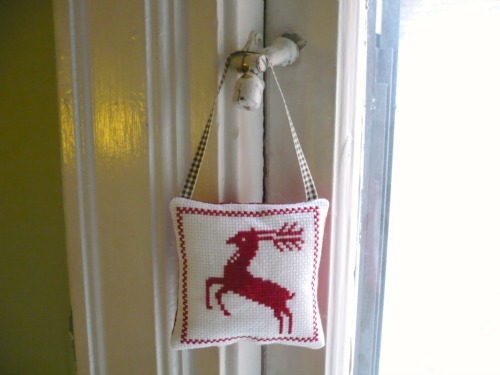 Hang it on a tree, on the wall, or anywhere else that might need a little Nordic spirit. 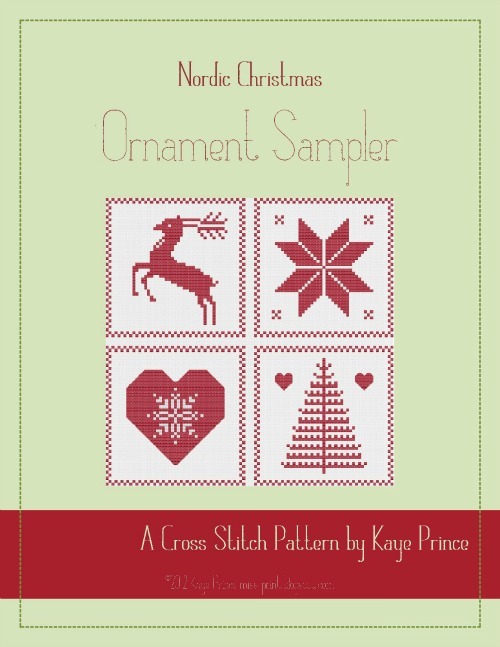 Nordic Christmas: Ornament Sampler is available from both my Crafty and Etsy shops! Tune in again next week when I will bring your the third, and final, instalment of the Nordic Christmas series. As many of you know I am President of the Toronto Modern Quilt Guild and this year I thought we should have a little bit of fun to celebrate our last meeting leading up to the holiday season (we don't hold a meeting in December because that would be crazy). Back in August and September guild members brought in sandwich sized ziploc bags full of scraps and we swapped them out. 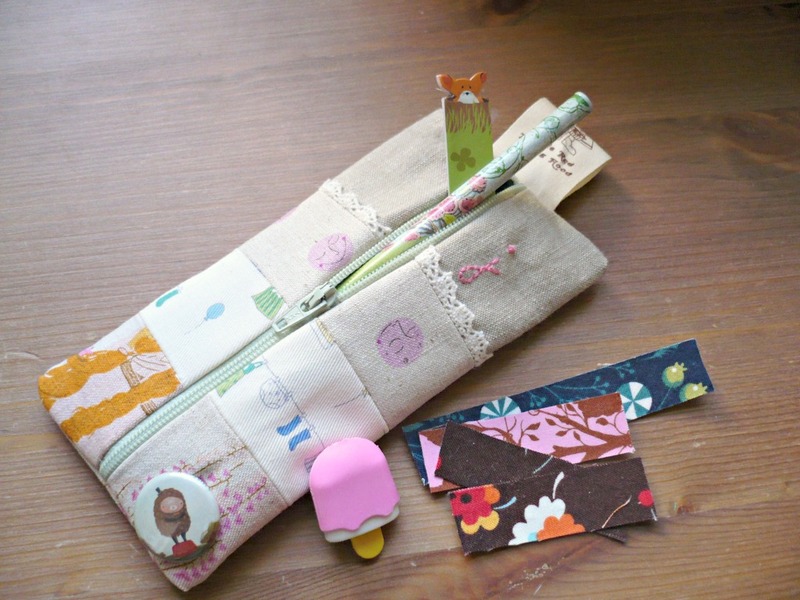 We each then made some small giftie type items using the scraps and held a secret Santa/mystery gift swap at this month's meeting. 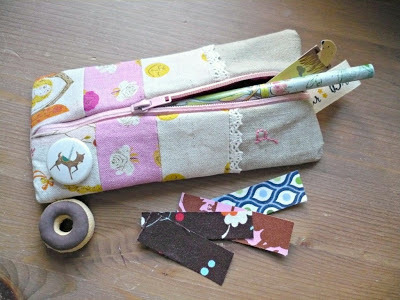 I received Doris's scraps and made these three small items. 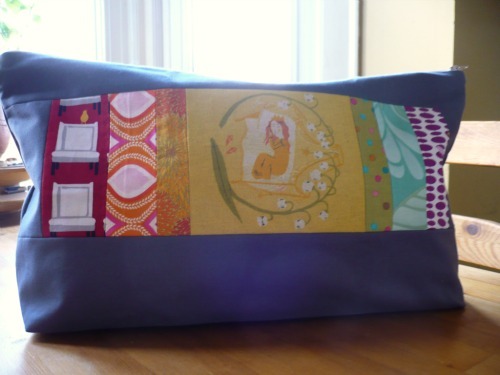 I originally was making a tote with patchwork pockets but somehow managed to totally jank it up, so I cut the pockets down to make the mug rug and the pincushion. The tree ornament is loosely based on Anna's tutorial, however I didn't use her template and just free handed everything (I'm sure yours will turn out much nicer if you actually follow the tutorial). Doris's scraps aren't really my style but I wanted to try really hard to use the scraps that I was given and not much else (which wasn't part of the rules for the swap but I wanted to challenge myself). The only things that didn't come from Doris's scraps were the felt and baker's twine for the tree. 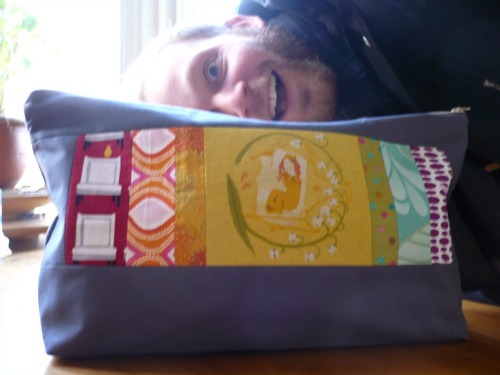 Funnily enough, the mystery gift I received was actually made from my scraps! Sheila made me this lovely (and giant) zipper pouch and used a few of my scraps to create a rainbow effect across the front. Sheila boxed the edges of the pouch so that it can stand up on it's own. In the picture it's got reusable shopping bags stuffed inside, but I'm planning on using it to hold either sewing supplies when I need to travel (I think my Clover mini iron will fit well in here with a slew of other things) or to hold knitting projects that require longer straight needles. Now didn't Sheila do a fabulous job? I love it! I totally got photobombed! Yep, that's Alex. Oy. Congratulations Lesly! 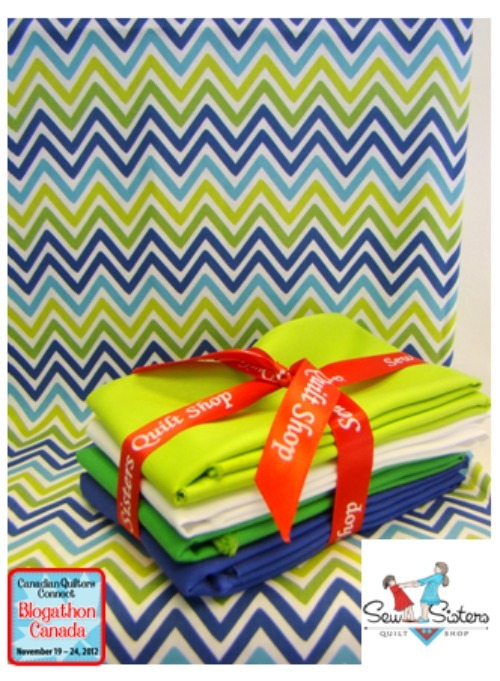 Please get in touch with me with your mailing address and I will have Sew Sisters send your fabric out to you! So, I have another new fun pattern out! 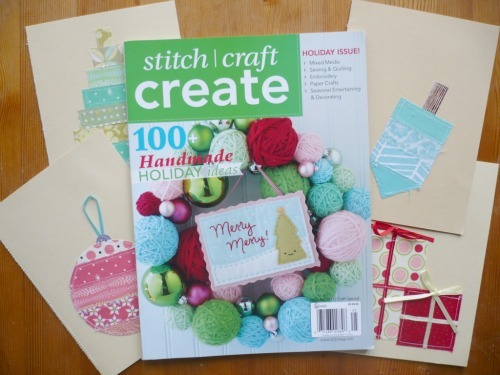 This one can be found in the Holiday 2012 issue of Stitch Craft Create on newsstands now! Eeek, don't you just love the cover?! The centre embroidered piece there is done by the super-talented Mollie of Wild Olive and the pattern is included in this issue. 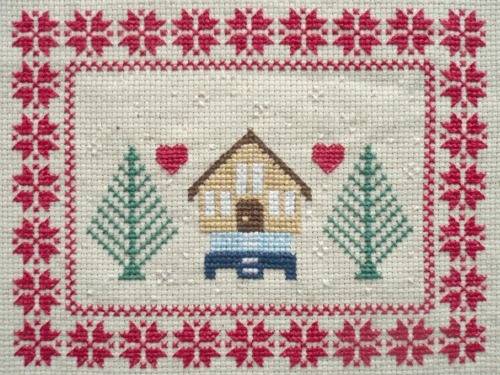 My pattern is called Scrappy Stitched Season's Greetings! 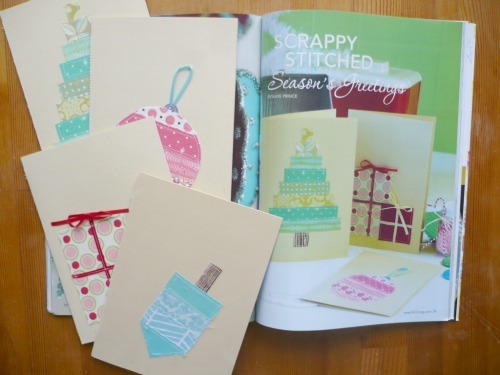 I've been making stitched cards with fabric scraps for a couple of years now, but these specific cards were not only inspired by the holidays but also by the fact that I know some SCC readers asked for more projects featuring small scraps. 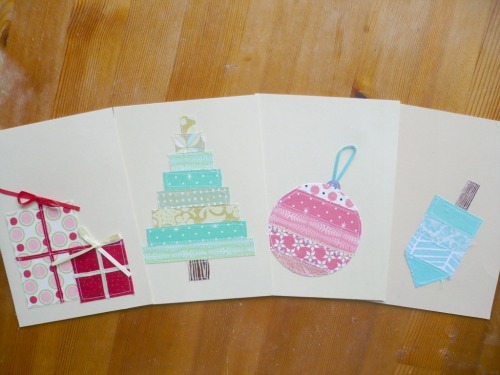 I made four cards which are featured in the magazine - presents, Christmas tree, ornament, and dreidel (y'all know we celebrate Chrismukkah around here, right?) 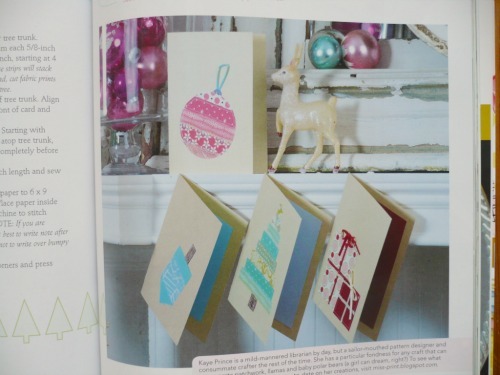 - there are full instructions for the tree card and then notes for creating the other three using the same techniques and added embellishments. I just love this picture of the cards on the mantle - the styling in SCC is just fabulous! As you can see the cards are all lined with cardstock to cover the backs of the stitching and there are instructions in the pattern for how to achieve that nicely. 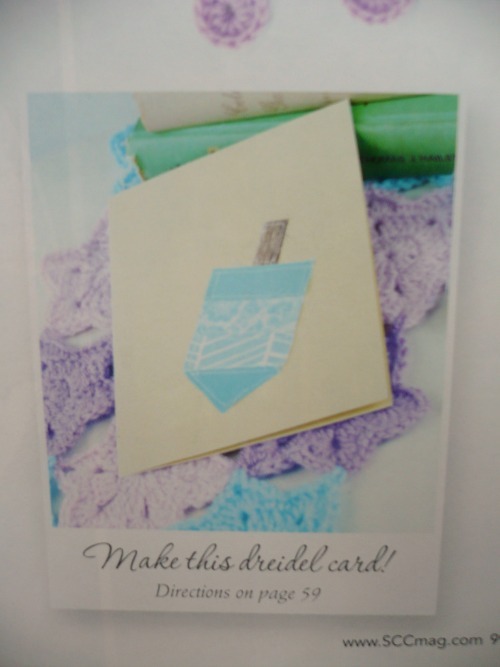 The dreidel card also got it's own little special mention at the end of Sara Dahan's Hanukkah Stars & Hexagons bunting pattern. The cards feature all kinds of scraps from my hoard! Both the tree and ornament cards have lots of scraps from Sheri McCulley's Have a Sherri Berry Holiday collection which came out a few years ago (some of the same fabric was used in both my Countdown-to-Christmas and Winter in the Woods patterns). There's also some Joel Dewberry (I am so going to cry when I run out of the herringbone and wood grain fabrics) and Sandi Henderson, along with some other random bits I had. Actually, mentioning Countdown-to-Christmas made me think of something - Sheila took a fabulous picture of it at one of the recent TMQG meetings! 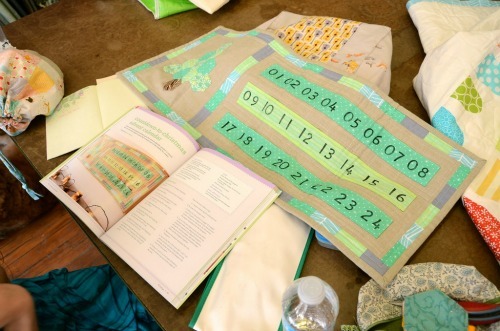 In this picture you can see the actual colours in my advent calendar for the Pretty in Patchwork Holidays book. Unfortunately the picture in the book is incredibly washed out and the calendar just doesn't look as cheery as it appears in real life! I'm glad Sheila took this picture because I don't think I took any pictures of it other than one sort of quick shot when it was completed. Anywho, yes, so this issue of SCC is on magazine stands now and will be available until about midway through December (I believe the next issue comes out sometime around December 13th or so) - some of my favourite parts of this issue include the Alabama Christmas spread, the fun guide on what to put in a crafter's stocking, and Corey's Fresh Forest quilt pattern. Get it while it's hot!! After Sewing Summit finished up I received a notification asking if I'd like to participate in a swap being held for people who attended - of course I said yes! I received my partner notification a little while later and had been busily thinking of what I should make her; I looked though her blog, Flickr, and Pinterest and still had no idea what to do! Her style is close to mine in some ways, but many of the things I thought to make her she had already made something similar for herself. So I settled on "cute" with a few extras, hah! 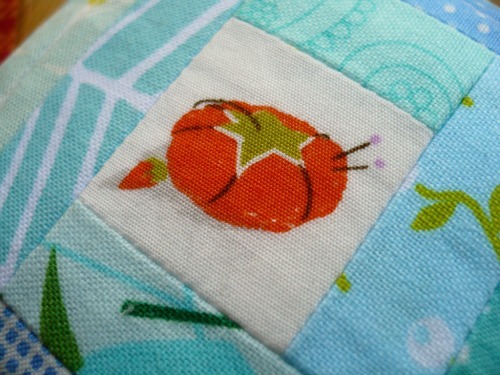 Using a little munki munki from Heather Ross and a lot of blue scraps I made her a small log cabin-inspired pincushion! The finished size is about 4x4" so each of the little strips measures half an inch wide finished - I don't think I've ever made a log cabin using such small pieces before but it was pretty fun to work in miniature. The scraps are a mix of all kinds of things - Joel Dewberry, Heather Bailey, Liesl Gibson, Lizzy House, and a slew of others. I forgot to take a picture of the back but I used Mixed Signals in Sea Foam from Anna Maria Horner's Innocent Crush and sewed on one of my own "handmade by" labels too! It's hard to see in the pictures, but I also added some batting to the top and did a little bit of quilting before putting it all together. 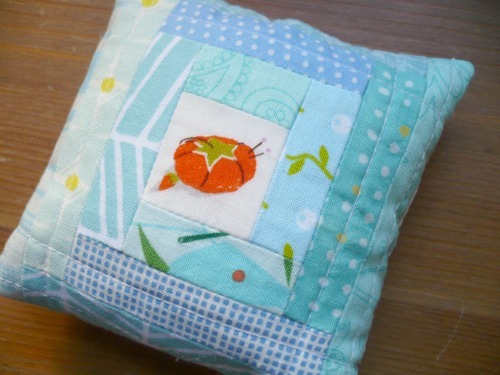 I thought I was being pretty clever putting the munki munki tomato pincushion in the centre of an actual pincushion... oh, I slay myself! 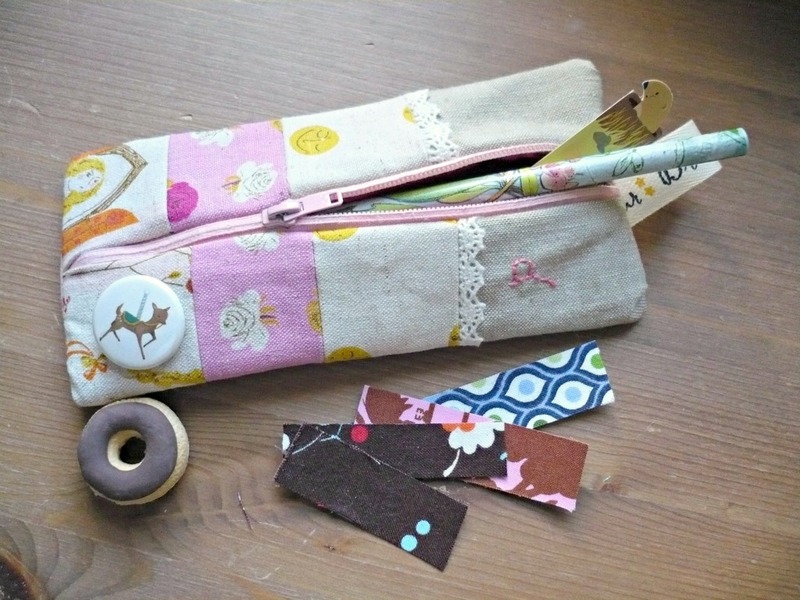 It really is just the perfect fit too - miniature pincushion on a pincusion - good times! 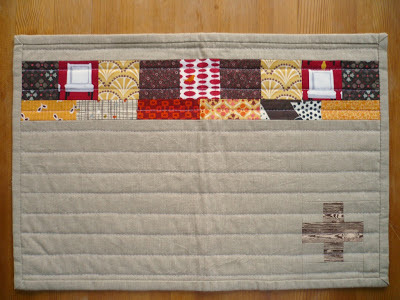 My swap partner mentioned that she loves Denyse Schmidt's new Chicopee so I included a 2.5" square of all but two of the fabrics in the collection because I know she likes to make EPP hexagons. I also included two of my own handmade washi tape magnets as a little extra. My partner hasn't received her package yet (so I can't reveal who she is), but I really hope she likes it! I haven't received my package yet either, but I've seen some really great stuff posted to the Flickr group and am really excited for it to arrive! As many of you know I am part of the Joy Circle for do. 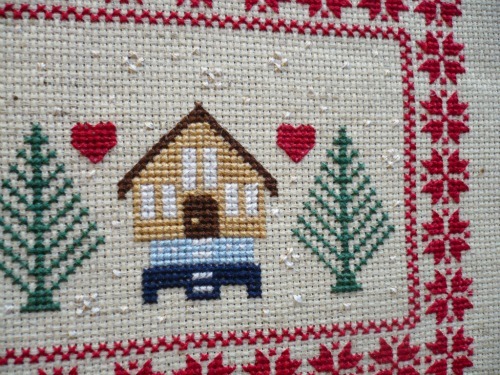 Good Stitches; October's block was chosen by Elaine and was such fun to make! Hot air balloons!!! 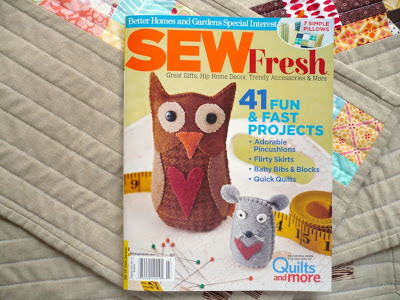 This is a paper piecing pattern available for free from Quiltmaker Magazine (you can find it here). In the original version the balloon part is done using one fabric (as with my version on the right) but Elaine told us to go ahead and do anything we wanted with our balloons, so I did the second one kind of scrappy and just paper pieced the strips into the available space on the balloon template. For both the background is a light blue Kona (sorry, can't remember which one) and the baskets and stems are also Kona (I believe it is Mocha). 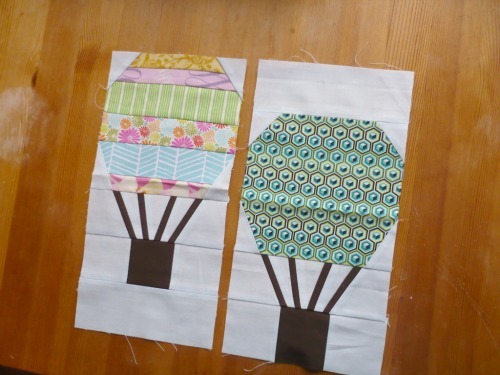 The balloon on the right was made using some Tula Pink Prince Charming, and the balloon on the left is a mix of scraps from Parisville, Modern Meadow, Terrain, and Dream On. The three winners of a copy of Simply Fat Quarters are... Krista of Poppyprint, Stephanie of Sewing by Stephanie, and Allison of Dreaming in Patchwork. 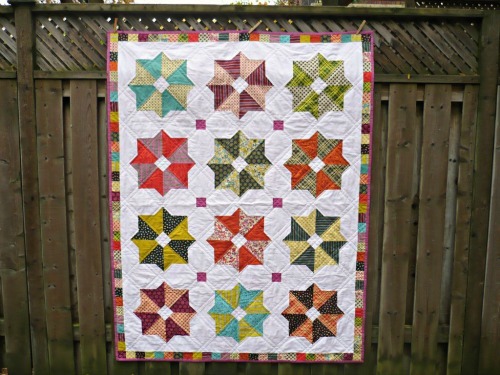 The mega-big winner of a copy of the book as well as the Chicopee fabric to make the Poppy quilt is... Caitlin of Salty Oat Modern Quilts! Congratulations ladies! Please send me an email with your address so that I can have Fat Quarter Shop ship your winnings out to you! It's a pretty good list I think! 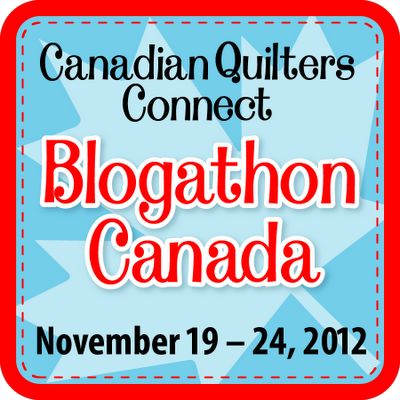 Each of the participants will also feature a list of quilting bloggers within their own province/territory so if you would like to be mentioned in your area's list, please see this blog post from Sew Sisters for the details! Hey y'all! 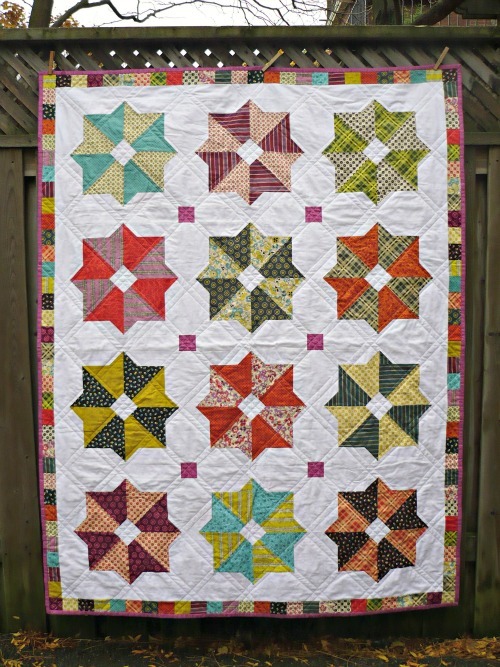 I have a new quilt and a pretty good giveaway to share, so let's get right to it! Meet Poppy! The pattern for Poppy was designed by the super-lovely and talented owner of Fat Quarter Shop, Kimberly Jolly, and is featured in their new book release (under the It's Sew Emma designation) Simply Fat Quarters! I was pretty excited when Kim asked me to participate in this little tour for the new book and elected to make this lap-sized version of Poppy out of the new line from Denyse Schmidt - Chicopee. Chicopee has a lovely hand and I am absolutely in love with the bursts of raspberry and chartreuse in the prints. 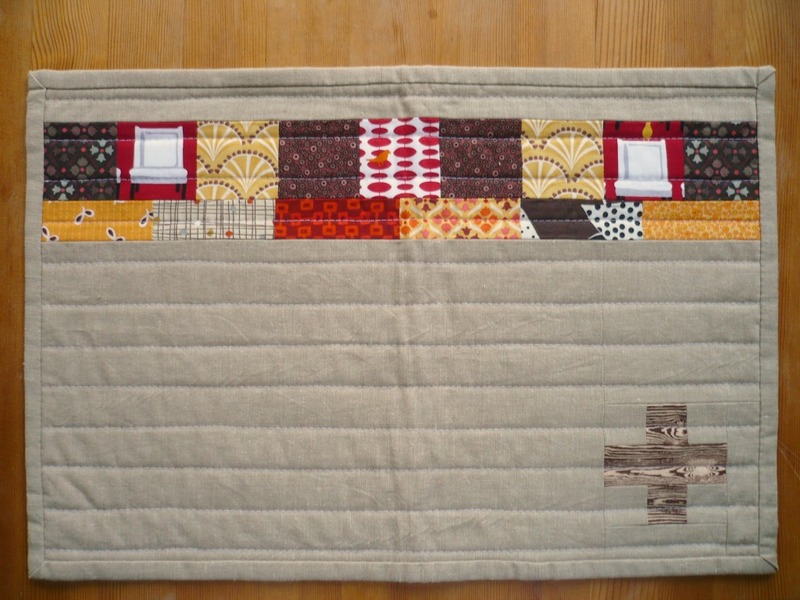 Unfortunately, due to the rather windy conditions in Toronto caused by Hurricane Sandy, I was unable to get a picture of the back of the quilt. While taking the front ones the wind picked up some much that the quilt actually flew off of the fence and I had to chase it down. 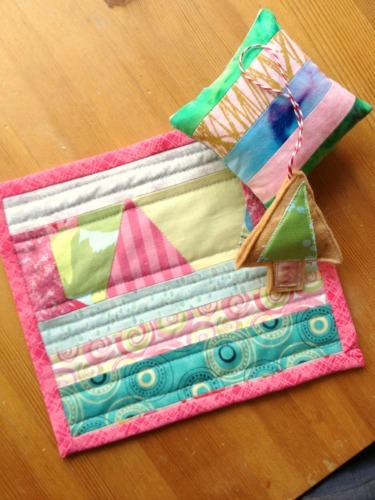 I figured it would be safer to just go with what I had and not risk losing the quilt all together. 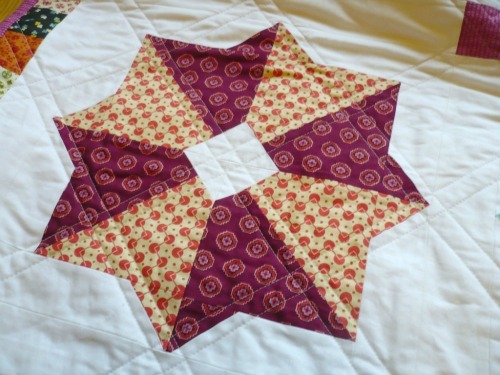 I quilted Poppy using straight double lines on the diagonal and spaced them sort of unevenly where they cross so that the spaces for both larger and smaller squares and rectangles. Makes it kind of fun I think! 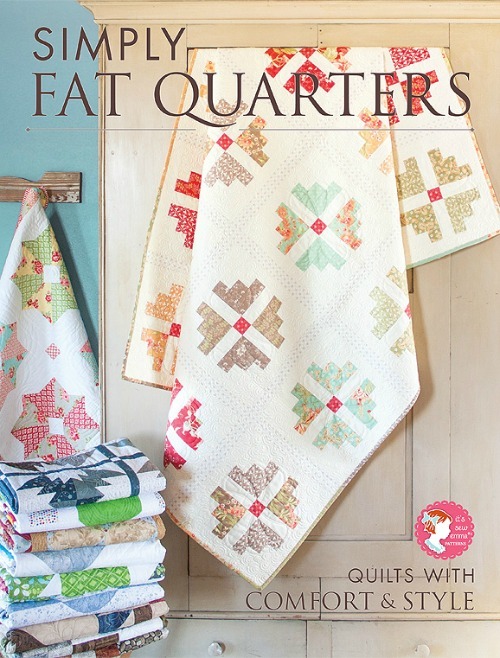 Simply Fat Quarters features 10 fat quarter friendly projects in a range of sizes. The pattern for Poppy comes in four sizes - Crib, Lap, Twin, and King - and includes great diagrams and step-by-step instructions. This is actually the first time that I've ever made a quilt using a pattern and I must say that it was a bit of a challenge for me not to go and change things and do them a bit differently! Not because of the pattern itself of course, that's just the way I am! So I bet you want to know about the giveaway, eh? Well, there will be four prizes... yes, that's right, I said four! 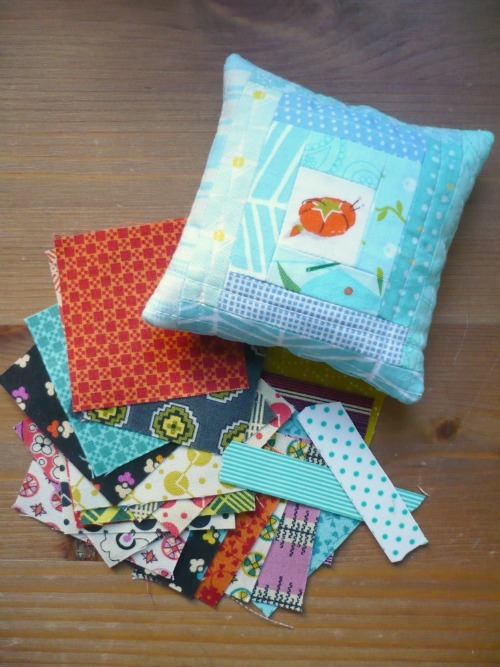 One very lucky winner will win a copy of Simply Fat Quarters along with a kit to make my version of Poppy - that's a heck of a lot of Chicopee! 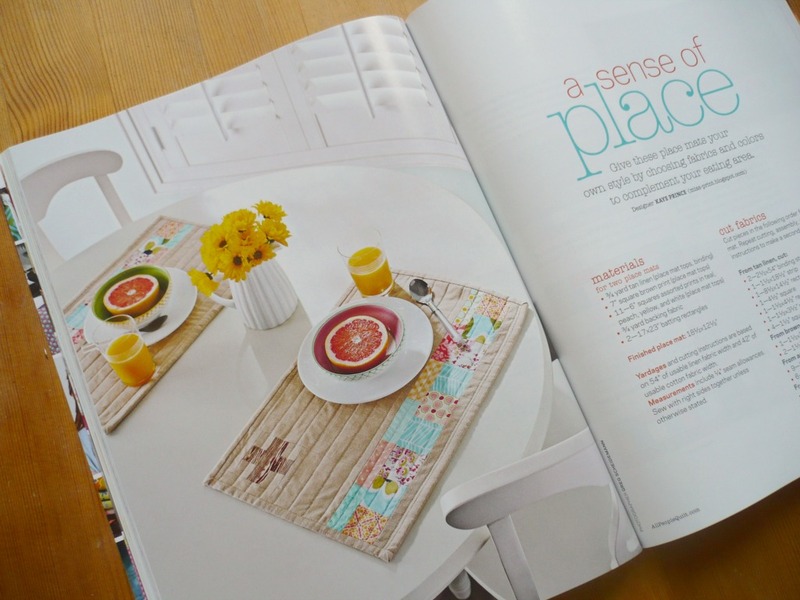 Another three winners will each win a copy of Simply Fat Quarters - not too shabby! 1. 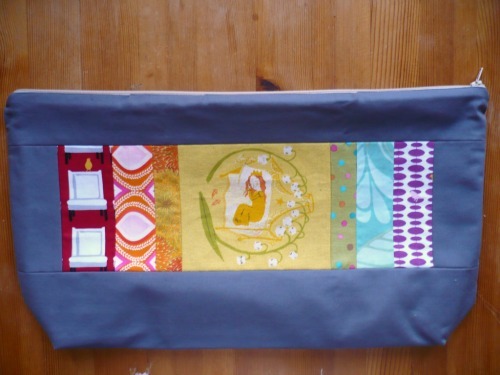 Leave a comment letting my know your favourite way to use fat quarters. 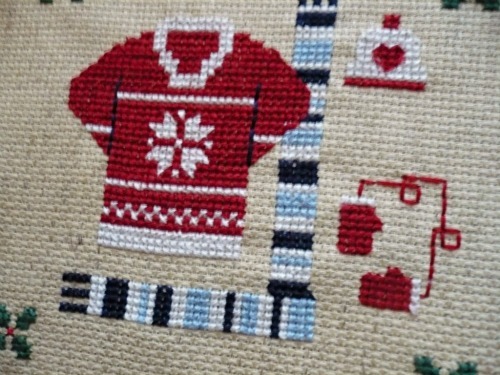 If you have a link to a pattern/tutorial that would be great! 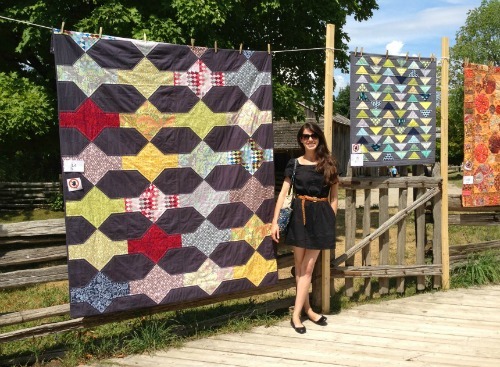 It doesn't have to be a quilt - I'm looking for some good gift ideas here! That's it! Two easy-peasy ways to enter! 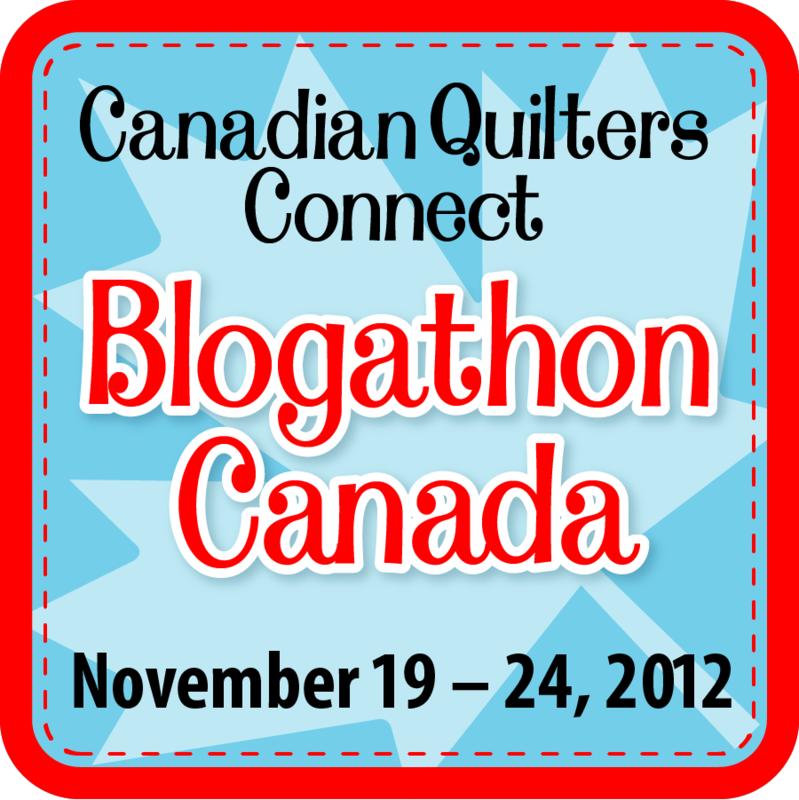 I will close the comments in a week (November 12th) and announce the winner here on the blog. International entries are, as always, welcome! Also, please remember that I have comment moderation enabled so if you don't see your comment right away it just means that I haven't had the chance to approve it yet (duplicate comments will be deleted).